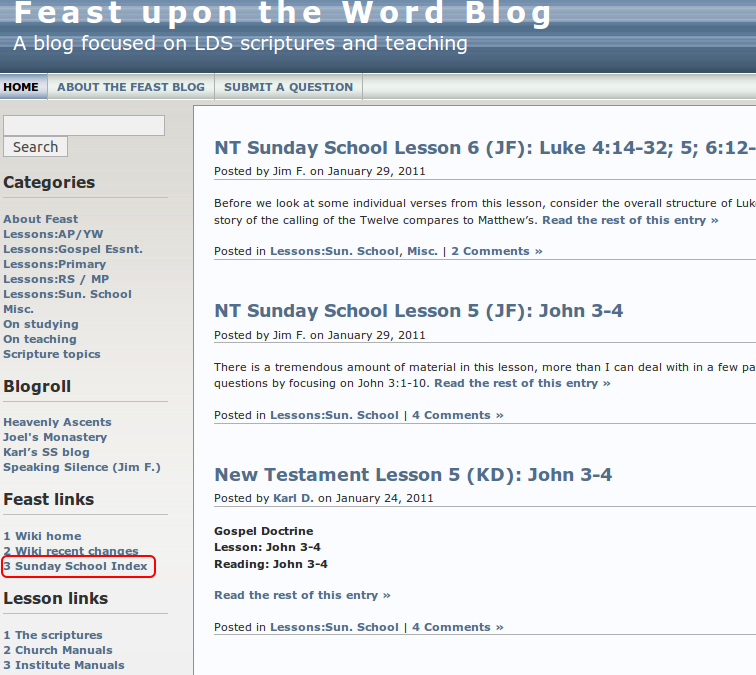 If you aren’t familiar with the Sunday School Index page on our Feast wiki, I’d like to introduce you to it. If you don’t know how to update it, I include instructions. 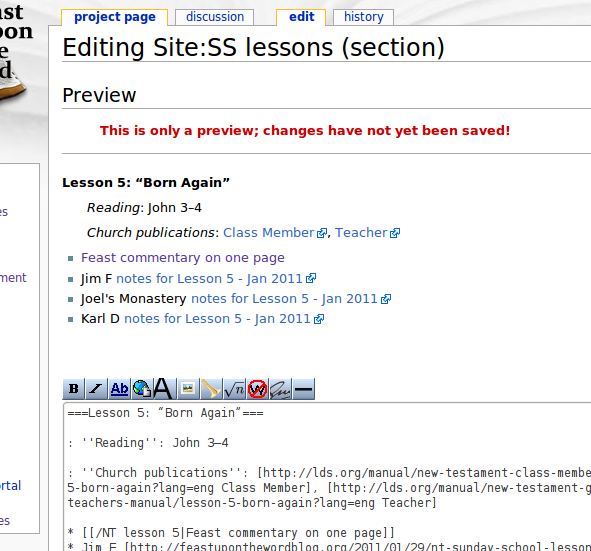 The purpose of the Sunday School Index page is mainly to provide links to the Sunday School Lesson materials on the wiki and on our blog. 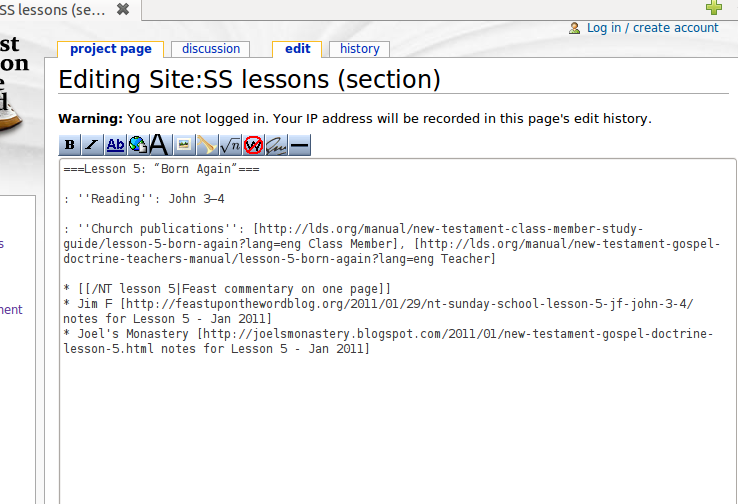 People are also welcome to add links to lesson material hosted elsewhere. If you aren’t familiar with it, check it out and see if it is useful to you. Here’s a picture of how to get there from our blog’s home page. Just follow the link outlined in this pic in red. Unfortunately, an index like this doesn’t automatically get updated when someone posts their lesson materials on the Feast blog. It has to be manually updated. The good news is that anyone can do it. And if just a few people spend a little time updating the index, its more valuable to everyone. So in the spirit of participating & helping, I encourage you to add links. The Feast Blog gets quite a few hits each week. Many of them come from people who already know the site. These people often go straight to our home page. Many come to the site after doing a search on a search engine. A lot come from other sites that send people either directly to our home page, or directly to a particular post. And quite a few come from the Sunday School Index page. By keeping that page up to date it means more people find the notes they are looking for. 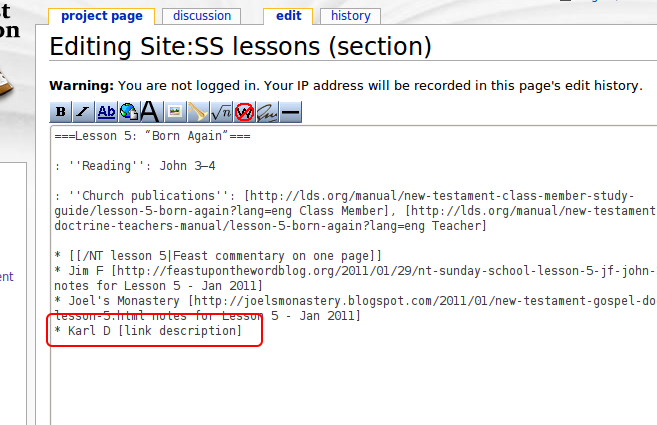 Here are the instructions for adding a link to the Sunday School Index page. I am going to take you through this step by step using an example. 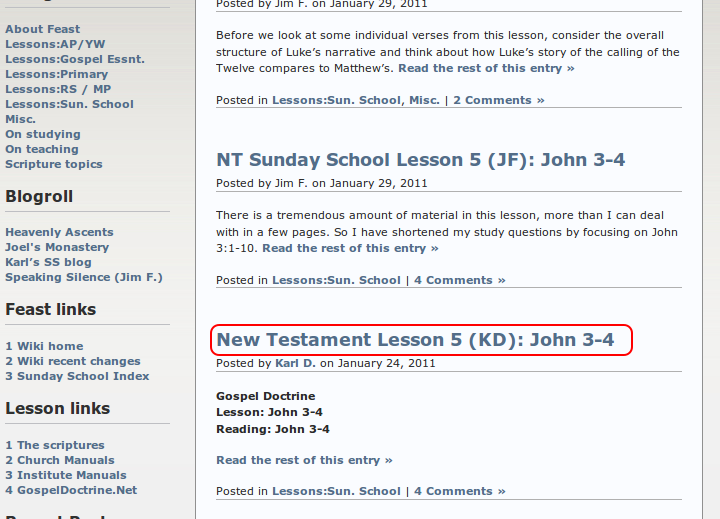 For these instructions I am going to add Karl D’s notes on the New Testament Lesson 5. 2) When you get to the specific page for that post, copy the URL. 3) Now go to the Sunday school index page by following the link to it. 4) And find the correct place in the index the link you will add belongs. The index page is divided into the different Standard Works with a section under that for each lesson. 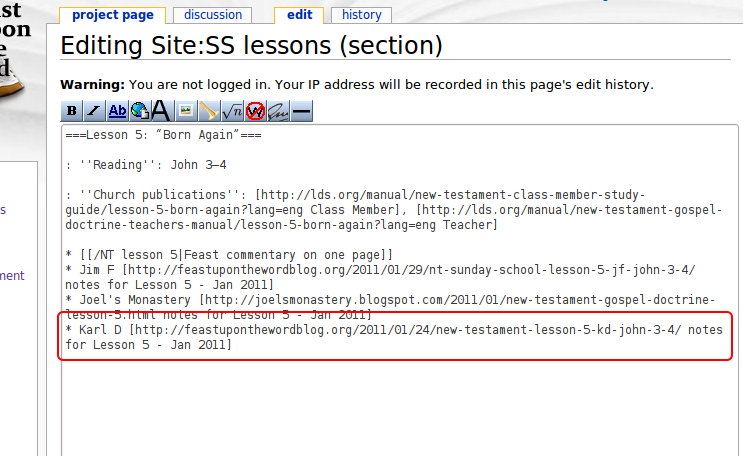 In each lesson section are all of the links pertaining to that lesson. 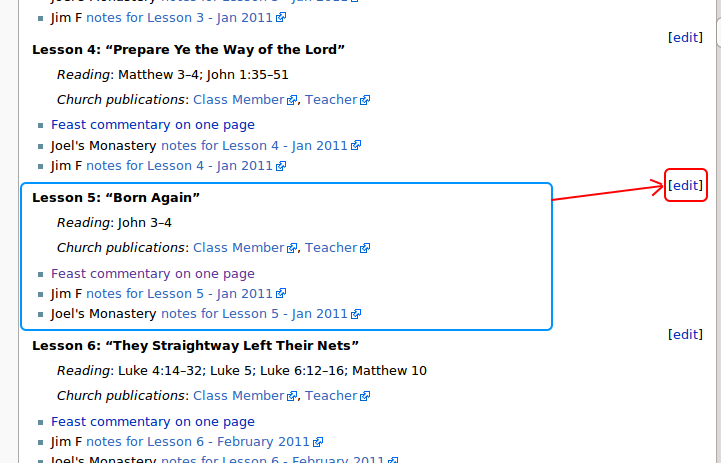 In this case we want to find the section for the New Testament Lesson 5. In the picture below I have added a blue box around everything in that section. Once you get to that section you’ll want to click on the Edit link for that section. The edit link is located to the right at the top of the section. 5) Once you click on the edit link you’ll be taken to the following page. Don’t be intimidated when you see this. It’s easier to add the link then you might think from looking at this page. 6) This part is just a bit tricky but not too hard. Place your cursor within the big text box after the stuff that’s already there. Then type the part I have highlighted below exactly as it shows except that you’ll replace Karl D’s name with whoever’s post you are linking to. 7) You aren’t out of the woods yet but you’re close. Notice the last part of what you just added: open bracket, link, space, description, close bracket. That is the particular syntax you use to add links on our wiki (and other wikis that use similar software like wikipedia). Now replace the work “link” with the actual link to the post. You already copied it into your clipboard. You just need to delete the letters “link” and paste the actual link in the same spot. Next do the same for description. 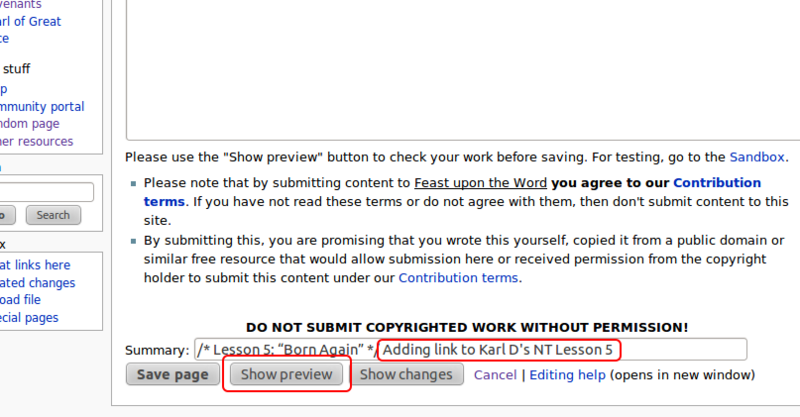 In this case I replaced “description” with the words “notes for Lesson 5 – Jan 2011.” Make sure to have a space between the actual link and the description for the link. 8) OK. That’s the hard part. These last steps are pretty easy. Go to the bottom of the page. Add a few words telling people what you are doing and then click the “Show preview” button to make sure it comes out looking just how you want. 9) And here’s what it looks like. 12) Once you have answered your math question you need to go to the bottom of the page and click save again. Let me know if anything above is confusing or has any errors. Feel free to post questions. And, thanks in advance for helping to keep our index up-to-date ! This entry was posted on February 2, 2011 at 12:21 am	and is filed under Misc.. You can follow any responses to this entry through the RSS 2.0 feed. Both comments and pings are currently closed. I encourage everyone to add their links. I know that adding links to Joel’s Monastery for the Gospel Doctrine lessons has greatly increased the numbers of people viewing my blog. I have learned much from also reading Karl and Jim’s notes, including the questions without answers they often post – forcing me to do my own thinking. This site is very good for references and helps me keep up to date on my scriptures and study. Thanks so much.